Students who joined the Sophomore College course "Water and Power in the Pacific Northwest: The Columbia River"
traveled to the Columbia River valley to understand the interplay between water, energy and human populations. Flowing from Canada through Washington to Oregon, the Columbia River winds through snow-capped peaks in the northwestern United States, and twists between rolling hills and valleys speckled with desert sage before reaching the spruce-filled coast and pouring into the Pacific Ocean. The country's second-largest river, it serves as a hub of hydroelectricity and breeding grounds for one of the most coveted types of fish: salmon. In mid-September, 12 Stanford students gazed into a tributary of the Columbia, Washington's crystalline Cle Elum River, searching for salmon that had already started clearing algae from shallow sediment to lay their eggs. As the students peered through the water, secluded in nature and miles from a light switch, their thoughts revolved around energy -- hydroelectric, nuclear, coal, natural gas, wind and solar -- and how these modern developments influence wildlife that has inhabited the Columbia River basin for thousands of years. During Water and Power in the Pacific Northwest: The Columbia River, a Sophomore College (SoCo) experience, these undergraduates studied water and energy resources in the West in the context of rapid climate change, ecosystem impacts, economics and public policy. The three-week field course provided an interdisciplinary approach for students of all majors entering their sophomore year to critically examine the challenges of managing the complex, interlocking water, power and environmental resources of the Columbia River basin in the face of climate change and population growth. "Coming into this, I had a pretty strong opinion on these dams and on the salmon, but being here and talking to people who passionately believe something very different has been eye-opening," said Kenzie Roan, a civil and environmental engineering student. "We can't do anything without water and energy and yet we think so little about it and talk so little about it in general conversation -- this makes you no longer take it for granted." "Our classroom is talking to people who work in the real world who run power plants, who run wind farms, who operate large irrigation systems, who take care of the fish in the river," said Sally Benson, one of the course co-leaders and a professor of energy resources engineering in the School of Earth, Energy & Environmental Sciences (Stanford Earth). "The real world is our classroom here." "I want them to come away with a much deeper appreciation for the complexity, the scale, the impact of our energy system and to realize it's not just about flipping on a switch, but behind that switch are thousands of people, communities whose lives depend upon providing energy and how energy is provided," said Benson, who is also co-director of the Stanford Precourt Institute for Energy. "I want them to use it as a lens for all of their future studies in energy, environment or whatever they choose to do in their lives." For many residents in the United States, energy is a simple modern luxury -- they turn on lights, fuel cars and cook meals, then pay to cover the cost. But the history of the Pacific Northwest reveals how people, economics and nature shaped a complex power system. "This area is almost prototypical in raising important issues that we all need to be thinking about -- especially sophomores at Stanford," said course co-leader David Freyberg, an associate professor of civil and environmental engineering. "The Columbia is really important because there has been a tremendous amount of conflict and a lot of interesting examples of the difficulties of managing a resource that's shared among different communities." Today, the Cle Elum River runs historically low because of a dam built up the river -- a disruption to the fishing patterns and sacred spaces of Native Americans. And yet the tributary is also an example of how a river can be managed for multiple purposes, since its water is high enough for the salmon to swim up and spawn. "Salmon is the linchpin species that holds us together," University of Washington professor Craig Thomas told the students at the State of Washington's Department of Ecology in Union Gap. Hydropower has made the Pacific Northwest's energy supply among the cheapest and cleanest in the country. But the economic demands of low-cost electricity, agriculture and shipping has pushed aside the needs of the Native Americans who have depended on the river system for 3,500 years. "Before it was Yakima County, it was Yakama country," said panelist Thomas Tebb, director for the Department of Ecology's Office of the Columbia River. "The resources you've seen on the river have sustained the lives of its people. ... We've been fighting over water here since the turn of the century." The group started its tour from Portland, Oregon, with majestic mountain views on the horizon, lookout points around every corner and sudden displays of vibrant wildflowers. Within the first two days, they explored resource disputes at the Museum of the Oregon Territory, hiked in the Columbia River Gorge, shared dinner with local Stanford alumni and learned about the development of shipyards at the Columbia River Maritime Museum. "The model for this program was set up by David Kennedy, the founding director of the Bill Lane Center: one week in the classroom, two weeks outside," said Bruce Cain, director of the Bill Lane Center for the American West, which has co-sponsored annual SoCo courses since 2011. "The tradeoff of taking a trip with us is that you work a little harder -- it's jam-packed with talks and visits." After driving by the Dalles Bridge to view Native fishing methods, the students toured the Dalles Dam run by the U.S. Army Corps of Engineers, the first of three large hydropower visits. Speaking about equipment and control of water flow rates, the dam's operations manager offered the first opinion to color students' understanding of energy production. The next day, they visited Portland General Electric's coal-fired generating facility in Boardman, Oregon. "I think it's very easy when you're learning about a coal plant to vilify the industry or the people, but once you meet them and see that they believe in what they're doing, and they think they're doing the best thing for the country, it really changes your perspective on a lot of different energy policies," said sophomore Joe Fenner. 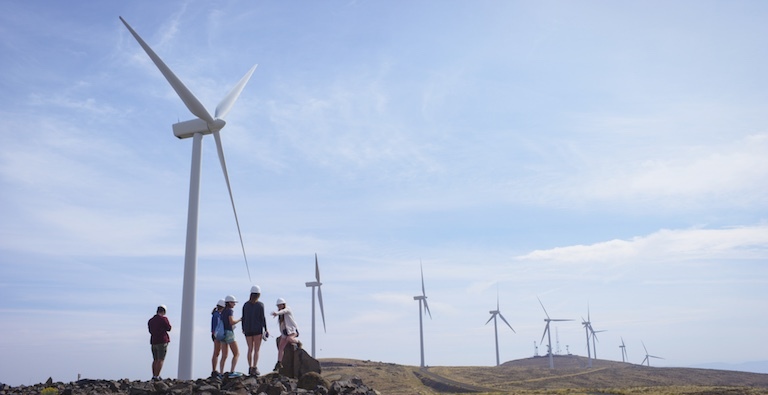 The students' reflections shifted from resource extraction to climate and weather patterns when they visited the Wild Horse Wind & Solar Facility built on the hilltops of a remote grassland outside Ellensburg, Washington. Turbines that look like birds from a distance became the size of school buses up close, held more than 300 feet overhead by shafts large enough for the entire class to fit inside. "You can't show these things within photographs and have a real gut-level response to the nature of the intervention and the environment and its role -- the spatial scale is really important," Freyberg said. The Grand Coulee Dam -- one of the largest concrete structures in North America -- is emblematic of the Columbia and its challenges. Completed in 1942, it is the largest single hydropower producer and provided the vast amount of power needed to make aluminum for planes and ships during World War II. "When I got there, I realized just how big of a scale this operation is, all the security that goes into it, the complexities of storing nuclear waste and producing the power," said Paige Brown, a chemical engineering student. "Everything is a lot more complex than the news stories make it out to be. I'm still very much in favor of nuclear power, but it's going to take a lot of political wrangling to get to the point where it's generally accepted." "I was surprised by how tied to the environment all the plant managers are," said Raja Ramesh, an electrical engineering sophomore. "When I thought of climate change before this, I was thinking big picture -- decrease emissions, lower temperatures -- but these people seem really tied to their local environments, and perhaps that's a better way to communicate with them." As the students gazed out the windows during the scenic drives, Freyberg discussed how the region's geological history shaped the steep gradients that make the Columbia River and its tributaries ideal for producing hydropower. He pointed out basalt in the different colors of rock layers and explained how the Missoula Floods at the end of the last ice age carved out gigantic basins. "I've done a lot of water research growing up, but with this class I realized that the Columbia River is a lot more than just the water," Brown said. "I actually became very interested in the geology surrounding the river, the political realities surrounding the river, and the people there and how they interact." "There is a lot of work to be done, and part of that work is talking to folks like yourself and the next generation of leaders, because it will be you and your peers working on this," said panelist Tebb, a Yakima Valley native with more than 31 years of environmental and engineering experience. Matthew Cohen, political science and Earth systems '18, participated in the energy-themed program in the southwest U.S. in 2015. It led him to explore Earth systems and declare it as a second major with his new perspective that effective policymakers need to understand science, he said. "The worst case is, you have a really good time and you figure out something you don't want to do," Cohen said. "I was trying to find an area to focus on, and this experience was great in developing that and getting to know the right people." "We try to create a mix of people interested in science and engineering together with those interested in humanities or arts," Benson said. "It's not just about the science or the environment, it's also about the social dimensions." "I am very undecided as to what I want to major in," said student Simone Speizer, who declared a major in the atmosphere/energy program in civil and environmental engineering after participating in the SoCo course. "I chose this trip because it tied in a lot of things that I was interested in -- water, the environment, energy -- and it's based in a location that I knew almost nothing about, so I thought it would have really great potential for learning about a lot of different things." "It makes me think about academics a bit differently because I've never had this much time one-on-one with a professor -- or three of them," Fenner said. "Being able to talk to them and learn more about education and the university in general is really useful." "You gain so much from being here and seeing it and feeling it," Roan said. "Feeling the spray of the dams is the best way to absorb new information."